Roadmasterparts1 "Where parts meet people". 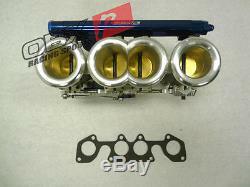 OBX Individual Throttle Body ITB VW Volkswagen 2.0L 8V Cross Flow Golf Jetta. Unfortunately, because OEM manufacturers often tend to prioritize cost over peak performance, ITBs are rarely equipped on most vehicles. OBX Individual Throttle Bodies (ITB) have very distinct advantages over an OEM single throttle body with air intake pipe system installed vehicles. Advantage over Single Throttle Body + Aluminum Intake pipe kit set up. Although, it is economical for most of the street and track tuned, setups are with cold air or short ram intake pipes. Air rushes into the intake manifold's plenum, when the throttle is opened. While the response time is relatively quick, there is still a brief pause between the time air rushes into and fills the plenum, and when it actually runs into each cylinder. No matter how well you dyno tune and test the engine or how balanced its components are, the lag will always be present. 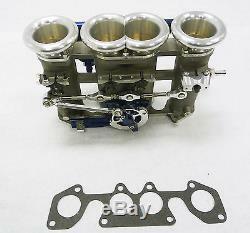 OBX Racing Sports Individual Throttle Body Manifold (ITB). Volkswagen MK3 2.0L 8V Crossflow. Built-In Vacuum Accumulator connecting to Brake Booster and MAP Sensor. Made with T6 temper 6061 ultimate tensile strength aluminum throttle body. Improve engine response and power output through the use of one throttle body per cylinder. Intake runner is made the same length of optimum throttle response. Straight induction ports provide the least resistance to reduce turbulence of the incoming air. Individually smaller in volume but allow much more aire collectively to provide both low-end torque to high-end power. Trumpet design is bench tested for optima airflow. NC machined 356 aluminum casting. Increase airflow resulting resulting in horse power and torque. Ruction included in the kit. Some product(s) are for off-road or show car purposes only. Some of the products may not be suitable for regular driving conditions. We are not responsible for any misuse of the products. Use at your own risk. We distribute tuning parts for use in the equipment of various manufacturers. Our company and the parts contained herein are not sponsored, affiliated, associated nor otherwise connected in any way with any automobile original equipment manufacturers named in this web site/page. Rademarks, service marks and trade names of OBX Racing Sports Parts use in the site are trademarks or registered trademarks of respective brand of OBX Racing Sports. For off-road competition/racing use only. This product is not intended to be installed on vehicles registered for highway use. LEGAL IN CALIFORNIA ONLY FOR RACING VEHICLES THAT MAY NEVER BE USED, OR REGISTERED OR LICENSED FOR USE, UPON A HIGHWAY. The item "OBX Individual Throttle Body ITB VW Volkswagen 2.0L 8V Cross Flow Golf Jetta" is in sale since Wednesday, June 07, 2017. This item is in the category "eBay Motors\Parts & Accessories\Car & Truck Parts\Air Intake & Fuel Delivery\Throttle Body". The seller is "roadmasterparts1" and is located in Fremont, California. This item can be shipped worldwide.